Horn defeats Pacquiao, new WBO welterweight champ via controversial unanimous decision - Balita Boss! Jeff Horn is the new WBO welterweight belt boxing champion after defeating Manny Pacquiao in a controversial unanimous decision after a 12-round boxing fight on Sunday, July 2 at Suncorp Stadium in Brisbane, Australia. Horn(17-0-1, 11 KOs) snatched the title from Pacquiao (59-7-2, 38 knockouts) via unanimous decision from judges Waleska Roldan, Chris Flores, and Ramon Seldan, with scores 117-111, 115-113 and 115-113 respectively, all in favor for the new champion. On the third round Pacquiao opened a small cut over Horn's eye, but Horn’s team had it in control. Pacquiao also had two separate cuts on his scalp due to headbutt in the middle rounds which covered his face in blood for much of the fight. The ninth round was in Pacquiao's direction and was able to land his signature straight left making Horn to a near knockout. Still, Horn managed to stay on his feet and go head to head with Pacquiao until the very last round. 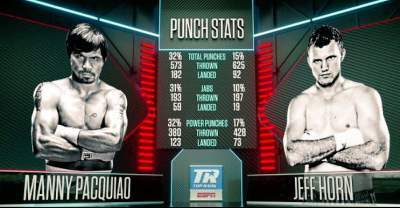 According to CompuBox, Pacquiao landed 182 punches throughout the fight while Horn had 92. Top Rank promoter Bob Arum says there are provisions for a rematch after the controversial fight.